Sadly it is time to say good bye to the Spring catalog products. 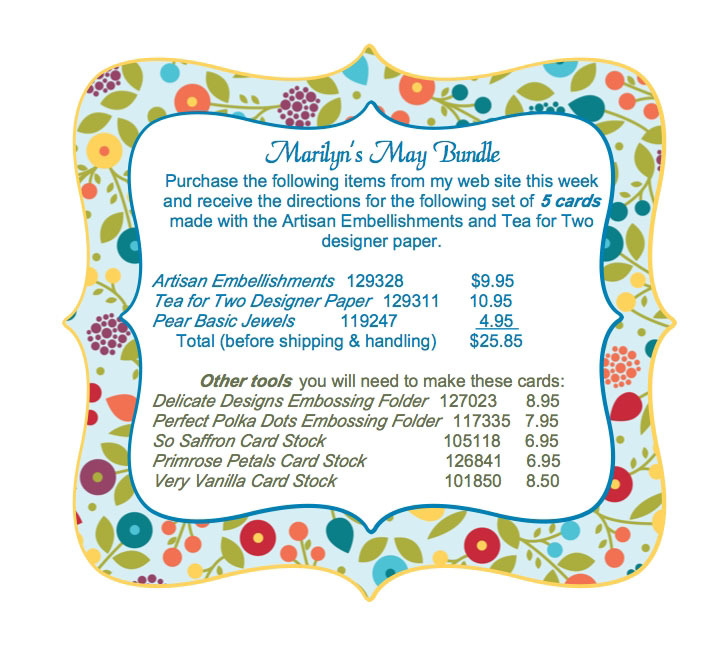 This is the last week for the Spring Catalog and Current 2012-2013 Catalog… One of my favorite embellishments from the Spring mini catalog is the Artisan Embellishments. So I challenged myself to make a set of cards using the Artisan Embellishments kit. 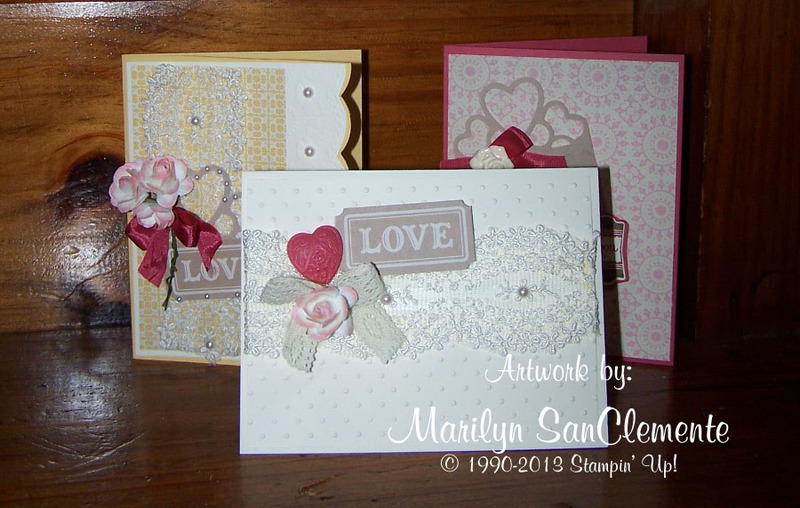 These cards have a definite vintage look with the beautiful lace that is included in this kit. They would be perfect for a wedding card or anniversary card! In fact, I gave one to a neighbor that got engaged last week and she loved it! What does this mean for you?? I have prepared a full set of color instructions for these gorgeous vintage cards. If you purchase $25 in SU product from my website before May 31st, I will send you the full detailed instructions for these 5 cards! NOTE: 3 Cards are pictured but there are 5 cards in the set! I have put together the items that you need to make these cards. You can place an order on my website here. I have setup a hostess code for this order. I love this new feature! When you get to the last page of the order, enter this code PJXJFU4B Your order gets processed from the point that you close your order but the order total goes into a party so one lucky person will receive the hostess benefits!! And don’t forget about the stamp sets and beautiful card stock colors that are retiring from the Catalog this week! Last chance to purchase these sets! You can see the list here. Happy Stampin’! artisan embellishments, handmade cards, Stampin' Up!, Vintage cards. Bookmark.